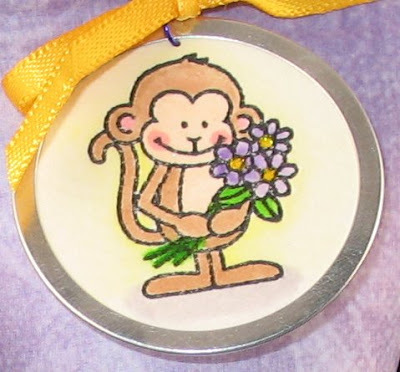 I've had this adorable little unused stamp from Dandelion Designs called Monkey for a while now, so I decided to use him for this little tag. This week's challenge at Pile It On is watercoloring so I stamped him on a scrap of watercolor paper and colored him with a waterbrush and Peerless watercolors. 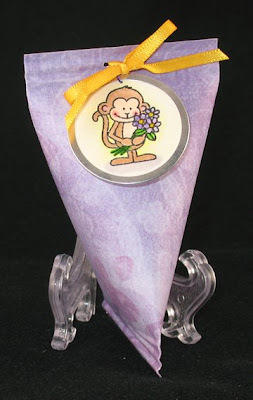 I added just a bit of Stickles to the flower centers, cut him out and stuck him into a Making Memories tag rim. Unfortunately the watercoloring doesn't show up very well on such a small image, so you'll just have to trust that I really did watercolor it! How cute is monkey? A great piece! Such a sweet image, love your container! Such a cute monkey and a fabbie give bag. Your tag is as cute as can be!! Just adorable! Thanks for joining in the Belli Challenge this week!! Adorable sour cream holder!! Love the little monkey. Thanks for playing with us at TPE!! Maureen your container is SO cute! What an adorable design and image!! How cute this is! I love the purple contaiiner, and that monkey on the metal tag is just darliing! thanks for joining us in the Belli this week. What a darling container! Your watercoloring is great! Thanks for playing along with us at Stamps and Smiles Project Tuesday! Fab project love the monkey he's cute. Thanks for joining Charisma this week. This is terrific. Love those little sour cream containers! Thanks so much for playing with us over at the belli challenge blog. fabulous creation and the little monkey is so adorable. Thanks for joining us at Charisma Cardz. Its fantastic to see something created other than a card for the challenge - its fab! Thank you for joining us at Charisma - good luck! That little monkey is adorable! Great image for a tag! Thanks for playing with us on the Belli Challenge! OMGosh! That monkey is so stinkin' cute! Wonderful job, thanks for joining the Belli Challenge!